Matzah emojis? Seder bingo? Hail, yes! Read on for 11 super-fun, easy-to-pull-off ideas for upping your Passover game. We have everyone fill out empty bingo cards using any of the 30 to 40 Passover-related words we give them: Moses, matzah, plague, desert. Everyone gets a highlighter, and the game starts as soon as the Seder does. If during a prayer they hear, "matzah," for instance, they highlight that word. The winner calls out Bingo! My husband and I often host Passover with our four-year-old twins, plus my brother&apos;s family, which includes a one-year-old and three-year-old. We like to keep the Seder fun...and 20 minutes, tops! Plastic flip frogs during the plagues help, but the most fun was when I brought out a king-sized blue sheet and had the kids "cross" the Red Sea. When we get to the point in the story when the Israelites crossed the Red Sea, my brother and I each grab a side and shake it. The kids have a chance to run through because Pharaoh is right behind! It gets them up and moving and is a good break in the Seder for them. Ask kids to try munching on the edges of a square of matzah, like a mouse, to turn it into shapes like a heart, flower, or their favorite emoji. Or maybe nibble two triangles and attach them with some charoset to make a Jewish star. The book read during the Seder is called the Haggadah, which in Hebrew translates to "to retell." Hagit Lewis, Jewish visionary leader at Bernard Zell Anshe Emet Day School in Chicago, encourages families to get interactive and invite their kids to retell the story in their own way. "I love to give kids a prop—a Pharaoh costume, a Moses basket and baby, a bag full of plagues—and let them retell whichever part they choose. Don&apos;t stress about them giving the perfect narrative. Just prompt them when needed—What happened next? How do you think that felt? – and let them express their thoughts. Julia E., a mom of two from New York City, says her family started this exact tradition two years ago. "The kids all gather in the corner during the eating part of the Seder and plan out a play or reenactment of the story of Passover, which they perform before dessert or when the reading of the Haggadah continues. We have a wide range of ages, from three to eight years old. It&apos;s a really nice way for the kids to get to know each other and engage with the holiday, and yet still leave the grown-ups in peace!" My new kids&apos; book, "The Best Four Questions," was inspired by my family&apos;s Seders, where both kids and adults were encouraged to ask more than just the Four Questions in the Hagaddah. 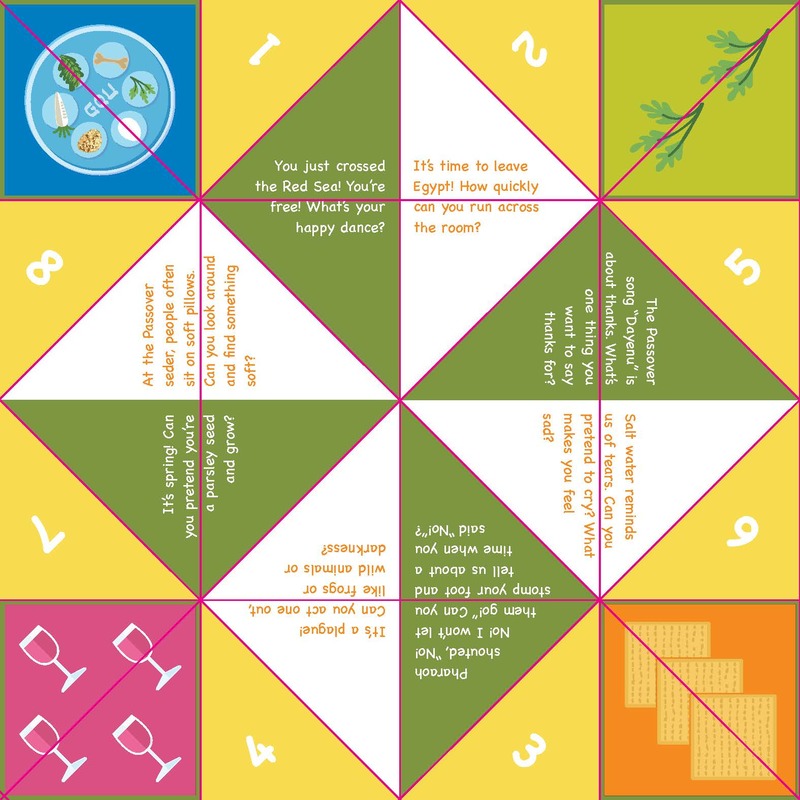 For inspiration, you can download a template for a "question catcher" from PJ Library, which is a take on those origami fortune tellers we all used in middle school to answer life&apos;s biggest questions. After choosing various Passover symbols, colors and numbers, a player lifts a flap to reveal a question. For the 4 years old and under version, that might be, "You just crossed the Red Sea. You&apos;re free! What&apos;s your happy dance?" or "It&apos;s time to leave Egypt. How quickly can you run across the room?" For the 5 and up version, it may read, "The &apos;hagaddah&apos; describes four children—smart, naughty, confused, and the one who doesn&apos;t know how to ask. Act out one of them. When have you felt like that?" For years, we used disposable tablecloths at holiday dinners. A few decades ago, I started using twin flat sheets instead. I&apos;d scatted permanent markers around and ask everyone to decorate and sign the sheet. We have art and signatures from some aunts and uncles who are no longer with us…and from kids who were in middle school then but now they&apos;re grown up with children of their own. We bring it out and everyone say, "Ohhhh, I remember this!" PJ Library has a Passover-themed playlist available on Spotify, featuring songs from the Maccabeats, Rick Recht, Meshugga Beach Party and more. For more musical fun, do what Hagit Lewis, Jewish Visionary Leader at Bernard Zell Anshe Emet Day School in Chicago does, and print out the lyrics to fun Passover song parodies found online, like "Passover Funk" (a take on "Uptown Funk" by Bruno Mars); "Let Us Go" ("Let It Go" from Frozen) and "Take Me Out to the Seder" (a riff on "Take Me Out to the Ballgame"). Invite Seder guests to sing along! Purchase "The (unofficial) Hogwarts Haggadah," penned by Rabbi Moshe Rosenberg, and inject some wizardry and witchcraft into your Pesach meal. From parallels between the Four Children and the four Hogwarts houses to an essay titled "Empathy for Your Enemies," HP fans both young and old should find something intriguing here. On Amazon, one reviewer said, "In years past, it was the Afikoman ritual that kept our kids glued to the table throughout the entire Passover Seder. This year it was the Hogwarts Haggadah!" Another wrote, "My kids (11 and 13) were so excited that they read it cover to cover when it arrived. That certainly has never happened with a Haggadah in this house." Go on an afikomen scavenger hunt. The afikomen scavenger hunt is centered around clues connected to the Seder plate items (Karpas, egg, shankbone, charoset, and maror). The kids on the hunt solve a riddle about each item, which leads them to the next hiding place. For us, the Seder is about welcoming others. We always make connections between the Pesach story and the refugees of today. My father&apos;s family are Indian Jews of Iraqi Jewish and Iranian Jewish descent. Growing up in London, I remember some of the family dressing up in traveler clothes to reenact the slaves being freed from ancient Egypt. There would be a knock at the door, we&apos;d answer "Who is here?" And we&apos;d hear, "We are travelers seeking freedom" and then the "travelers" would enter the room singing "Ma Nishtana." Now, at the Seder table, we talk about refugees and asylum seekers in our world today. We ask the same questions we do when thinking about the Hebrews leaving Egypt: Were they in a rush? What did they take with them? Were they scared? In this way, the traditions of the Passover Seder can help us—and our children—develop empathy and compassion for anyone who needs to find a new home.